RHYS BOWEN: The other day I talked about ways to handle stress. I think another of my ways is having toys around me. Okay, I admit, I've never really grown up. I still like to play. I remember once being on a beach in India. I caught a lot of tiny hermit crabs and lined them up to race back into the ocean. I looked up and was surrounded by solemn local inhabitants, women in saris, all staring and wondering if this was some kind of religious ceremony! It was great when my grandkids were small. I loved playing with them. My twins in Arizona had big cardboard building blocks. I would build a wall with them and the twins would hide behind it. They were the pigs and I was the big bad wolf. When I blew their house down they rushed around squealing in terror and delight. Or I put those blocks across the floor as stepping stones and I was an alligator waiting for them to fall into the water. Of course they always did! With my granddaughters in California we went into the woods and built fairy houses in hollow trees. We lined them with moss, made furniture, decorated them with flowers and wove curtains to hide the entrance. I was as thrilled as they were when we rediscovered one, years later and still in tact. Now they are all teenagers and sophisticated and I have to resort to my toys. I have toys sitting at my desk: an Edgar Allen Poe bobblehead, a Poe action figure with raven on shoulder, an Eleanor Roosevelt doll (perhaps the ugliest doll I've ever seen but I love her). And in Arizona, where I am currently, I have Eliot. He was a gift from my daughter and is wonderfully wise and inspirational. When I'm stuck with my writing he comes up with suggestions: perhaps you could hide the body in the trunk, he says. I've always taken toys with me when I travel. Hybird has been with me all over the world. Local people have stared when I perched him on Queen Victoria's head in Malta. When I go on book events I usually take my bears, Sophie and Alexander. You can tell which is which, can't you? Alexander has a naughty grin on his face and Sophie is always telling him to behave himself. I want to find the time to make them outfits and a house, but time seems to be the one thing I lack! My other traveling couple are Stanley and Livingstone. 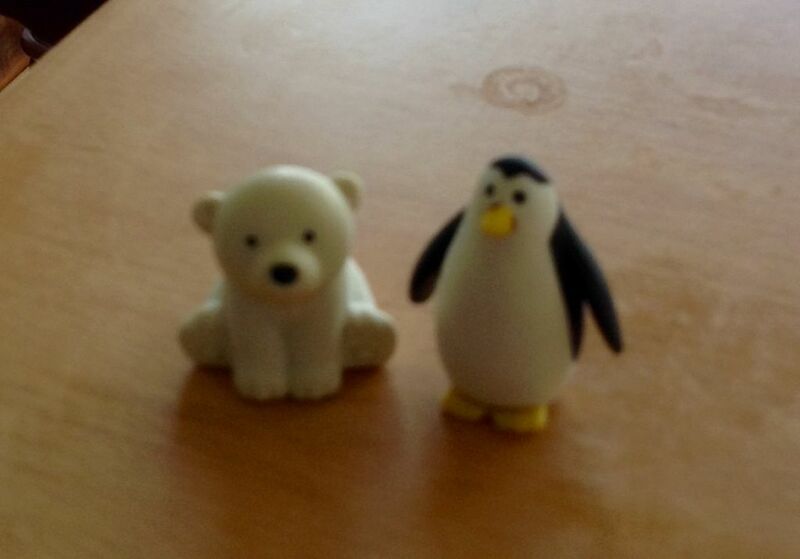 They are tiny rubber animals so easy to slip into a pocket in my carry-on, and have such cheerful faces. They always make me smile when I return exhausted after an evening at a bookstore. Stanley is the bear, of course. You can see he's a goofball, and Livingstone takes himself very seriously. So am I seriously deranged or does anyone else have toys around? I realize that what I lack is pets to play with, but we live in two places and travel so much that it wouldn't be fair to have a pet right now. Rhys, I’m certain toys should belong to all of us, not just the very young. I love your little animals. Around here, the bigger stuffed animals [like Corduroy] and the dolls [like the Cabbage Patch astronaut] keep each other company in the cradle that all my grandbabies have managed to outgrow . . . .
Fortunately, we still have Little Ones who are young enough to be enchanted by the contents of a toy chest, so I still get to play with Legos and Lincoln Logs and snowballs and all sorts of neat stuff . . . . I love stuffed animals, and don't even pretend I'm buying them for some younger person anymore. They perch on all my dressers and bookshelves, and pop out of cabinets and drawers. When I drove to North Carolina last year, my first stop was at a Books A Million in Texarkana, where I found a white wolf pup toy--some kind of "Game of Thrones" tie-in, I think--who kept me company halfway across the continent and back. My only concern is that I must keep them all out of reach from the dogs, who might mistake one of my toys for one of their toys and de-stuff it while I'm at work. At work I have three finger puppets to signal my state of mind to my co-workers. They take turns perching on top of my cubicle wall, next to the printer. The cute, flop-eared bunny says I'm willing to stop what I'm doing and chat if necessary. The little skunk, however, means you'd best avoid me unless it's an emergency. And the opossum? That means you should just pretend that I'm dead. Life is grim enough. I think we should encourage the spirit of playfulness wherever and whenever we can. Gigi, I love the idea of puppets as a mood signaler! What a good idea. I'll transmit it to someone we never know how to approach. I love those toys, and the fact that you take them traveling! I have a little windup scorpion (I'm a Scorpio through and through), an anteater from my first alma mater, UC Irvine, and a few little cars, but I don't play with them much. My childhood stuffed dog sits atop the radiator, with a hand-cuffed knitted red lobster on top of him (it's the Crime Bake mascot). My latest favorites are my action figures of Obama and the ferocious RBG. Hers comes complete with gavel. Those I do position differently every few days. And a tiny Buddha next to my office lamp isn't exactly a toy, but he does remind me to stay calm and breathe. I'd be very naughty and make Obama and Ruth dance the tango! I still have the monkey my aunt gave me when I was born. Zip will be 59 in February! I have my Raggedy Ann and Andy, who are turning 55 and my Barbie, who will be 54. I also have bears, both big and small, a huge purple chicken one of my girls bought for me and various dolls I have made over the years. Every one of them has a story and a memory. For my last book tour, I traveled with a porcelain doll that was made by the woman who inspired the book. She weighs a ton so she's been retired. My toys: a slinky; a stuffed Wild Thing. And piles and piles of toys for when the grandkids visit. Rhys, I think it is wonderful that you have found the best stress relievers and that you take them with you when you travel. I don't have any toys that I play with although I have kept some precious stuffed animals. I always loved dolls when I was young and made them clothes but I don't do that any more either. However I have several pets so maybe that is compensation. I have three shelves of stuffed animals. 'Nuff said. While sitting here reading this, I am tossing the ends of two ratty shoestrings tied together for Jimmy, the boys' younger male cat. Munch, the older male, loves it when I lie down on the floor and whizz bottle caps at him--he hunches down, both front paws ready, eyes watching to see if the puck is going to his right or left--and he almost never misses. :-) So, there are 'cat' toys strewn all over the house and plenty of playtime here! The same was true when the boys were little--plenty of toys, plenty of imagination, plenty of games--I hope we never outgrow playtime, Rhys! I don't travel with them; I bring them back from travels. My desk has a little collection of 2" long perfect souvenirs-a Hopi pottery bowl from Left Coast in Phoenix,a Greek vase from Crete,Delft patterned wooden shoes from Amsterdam, tiny hand-made pitcher set from an NC town devoted to pottery. I still have a hand-made doll house that was my daughters', I loved miniatures as a kid and -inspired by Rhys today - I plan to indulge myself with lots more. Triss, I bring back tiny boxes from my travels and they live in a glass-topped table. I had my childhood Edith the lonely doll refurbished. She sits on top of a secretary desk with my mother's Skippy doll. Otherwise, it's wall to wall dog toys, including the remnants of all the stuffed animals they've disemboweled. Oh dear - you had a childhood Edith the Lonely doll? How sad. I'm glad I didn't know about it in my childhood! My childhood toys are no more, but once in a while I see one on the Antique Road Show and wish I still had it to sell. I do have bits and pieces from my travels, little works of art that will never be worth anything to anyone but me. However I'm considering the RBG action doll! When the grandchildren come, they mostly want to go skiing if it's winter or to the Lake Ontario beach if summer, and the biggest treat of all is to build a snowman. They all bring their own electronic toys, so that takes care of inside time. However, we have a plethora of dog toys in this house. Penny Lane in particular likes to play, and each evening around five o'clock, she goes to her toy box and drags out Mrs. Fox or Bunny or Buffy the Buffalo (wart hog maybe?) or several tennis balls. She bring them to me to throw or play tug of war or whatever game she may have in mind. Toby watches from his place on the sofa, too dignified to join in childish games. I suppose Eliot the 24 toed cat and Toby and Penny the Pomapoos are my toys. I have my beary pillow that my grandmother made for me the day before I was born (we're 38). I also have a stuffed cat my dad made for me. Both are lifelong treasures. Sure I talk to them, they have wonderful insight. I also now have little Funko Pop figures (the Golden Girls, Groot, Rocket). Sometimes you just need to let your inner child come out. Rhys, I love the travel photos with your toys. I was reminded of Paddington Bear though I am not sure why. I still have a teddy bear from when I was about two or three years old. Bringing a toy when you travel sounds like a great idea. I am going to try that. Your stories about your grandchildren sound lovely. Hope you and your family are safe from the fires. I have a wide range of toys in my classroom. I teach high school and my students love my toys. Some are for fidgeting (mine or theirs! ), others are for comfort. I keep stuffed animals for my students who need something to hold on to on stressful days. I use everything as much or more than my kids but they really enjoy me keeping them available. The perfect pet substitute for a busy, always-on-the-go woman! And I'll echo others: a photo of a famous landmark is just like a thousand others (and professionals will have done it better.) 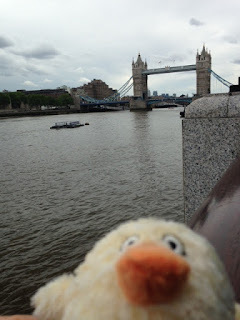 A photo of a famous landmark with an adorable stuffed duck? That's priceless. We grow old when we forget to play! Dear Lord, someone get Hank a toy! Here she is languishing in a hotel with snow headed her way and no toy! I travel with Missy, a palm-sized, stuffed polar bear. You may have seen her -- she's been to Bouchers and Malice. She's been known to take pictures with authors because she fancies herself quite the proponent of reading (she sends her pics to my nephew who didn't used to be very excited about reading, but now he is). She even sports a strand of gold beads from a Seamstresses' Guild Ball at a Terry Pratchett convention. 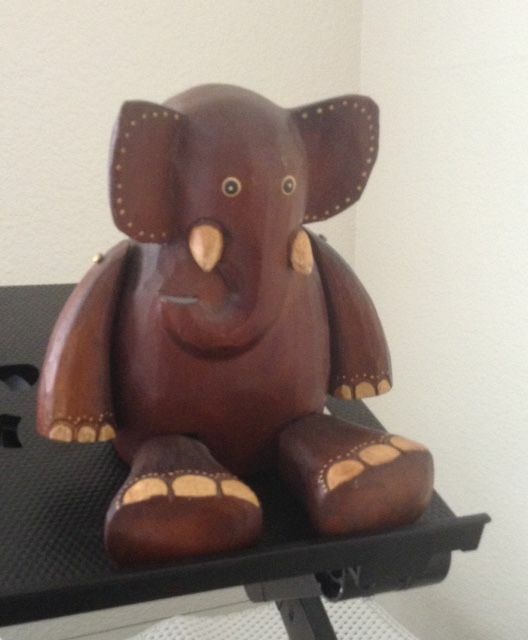 She was a gift to me from my nephew when he was 9 and she's been travelling with me ever since. Now he's 17 and has quite a collection of Missy's Adventure pictures. My Sherlock Holmes bobble head is always there to remind me that a good mystery will always perk me up. I also collect bears. While many are collector items, ther are a few that have soft bodies and are small enough to travel in a carry on. When my youngest niece was very young we played together with our stuffed animals, and I used to email her stories about them in between visits. At one point, when she was about nine, she became very worried that I might actually believe the stories! Well how funny, DebRo--you have a bear with almost my name! Play on! Signed, Melanie Elaine. I used to collect action figures when I was a kid. I don't play with them or anything these days of course, but I still have some leftover G.I. Joe and He-Man figures in a fishing tackle storage box in my closet. Plus a few assorted figures from other lines. These days I don't tend to collect much in the way of toys because I'd rather by comics, CDs, books and go to concerts. So something had to be cut of course. Plus I tend to not like the way the figures are made these days. They are entirely too articulated. I was the first kid on my street to have the original run of Star Wars figures (my uncle worked at a store that had them delivered by "Darth Vader" and I still have his autographed photo) and the way the Kenner company made them back in the late 70's was perfectly fine for me. Nowadays, I'm shocked they don't have each finger and toe able to be constantly moved around. However, on rare occasions I do find something that I just HAVE to have. I have some figures from Babylon 5 and The New Mutants. I had some Firely figure as well. They were all MIP (Mint in Package). The only figures I have displayed out of the packaging these days might reveal a bit too much about my personality. There's Deathstroke The Terminator (An assassin), Ravager (Deathstroke's daughter who has been a killer and crazy and sometimes both), Deadshot (An Assassin) and Moon Knight (who has spent time as a mercenary and crazy as well as the avatar for the Egyptian god Khonshu, sometimes all three). So that's my Toy Story. Whoops, just saw that the bears are teeny-tiny. I have a friend who crochets very small works, but it would be hard to fit . . . maybe a toga?